In February 2019, the family of the much celebrated foreign correspondent and war reporter, Marie Colvin, remembered the seventh anniversary of her death in the knowledge that a US court had just found the Syrian regime of Bashar al-Assad guilty of her murder. Killed in an artillery strike while reporting on what she claimed to be intentional attacks on civilians, Marie Colvin paid the ultimate sacrifice for her belief in the need to tell the world what she claimed the Syrian regime didn’t want the world to know. She died in the same attack as French photographer Rémi Ochlik, in a makeshift ‘media centre’ in the Syrian city of Homs. She had been working with English photographer Paul Conroy who survived the same explosion. In the days that followed, Paul Conroy suffered excruciating pain from a hole in his leg that he remembered as being big enough to get his hand through. Lacking food, water and medical supplies, he endured another five days of bombardment before escaping the decimated district of Baba Amr on a motorbike through a three-kilometre long tunnel. Talking later, Paul described how the missiles first took out the room they had been sleeping in, then the front room and then the middle room. He remembered the explosion, the smoke and the deafness from the blast, and later explained that the pattern of the bursts proved there was ‘bracketing’, a military tactic used by artillery units to ensure they hit their target. He recognised the pattern and timing from his own experience in the British Army. There had been three strikes, and he hoped that might be it. But a fourth rocket impacted right in front of the house. In Under the Wire, he described it as ‘like being hit by a tube train in a dark tunnel’. He lay on the ground next to the bodies of Marie and Rémi for fifteen minutes, while what he believed to be a drone, relayed pictures back to the artillery. Five days later he was put in a truck along with other injured, and a convoy of about four trucks drove through the front line to reach the tunnel, where the motorbike took him to the end. He had initially refused to get on the bike as there were other injured women and children that he thought should have been brought first, but his rescuers told him he had to go so he could tell the story. The following year he published his book Under the Wire detailing what became known as ‘Marie Colvin’s last assignment’. 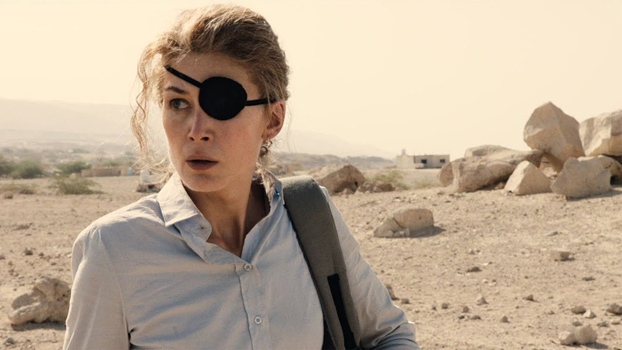 Last year it was released as a documentary and this year the story of Marie and Paul’s reporting from Homs has been made into a full-length movie, A Private War, starring Rosamund Pike, Jamie Dornan and Tom Hollander. Based on an article in Vanity Fair by the journalist, Marie Brenner, the film will be screened at this year’s Bridport Film Festival ‘From Page to Screen’ where Paul and journalist and war correspondent, Jon Lee Anderson, will be in conversation afterwards. Marie was known for her determination to report the real stories of the people caught up in conflicts such as the Syrian civil war. She had reported, with her own brand of outrage, from locations such as East Timor, Libya, Iran, Iraq, Kosovo, Chechnya and Sri Lanka, where she lost the sight of an eye when attacked with a grenade. After that particular attack, she became known for wearing a black patch over the blind eye—a badge of both defiance and honour that no doubt made her a more easily recognisable target. However, and despite suffering enormous emotional trauma after Sri Lanka, she carried on reporting atrocities with the oft-repeated question to anyone who would listen: ‘Why is the world not here?’ For the last seven years, Paul Conroy has made it his business to tell Marie’s story, consistently echoing that question. Talking to Channel 4’s Krishnan Guru-Murthy earlier this year, Paul made clear his belief that, despite being targeted as journalists by the Assad regime, western governments’ inaction in Syria was also a disgrace. ‘The West behaved abysmally’ he said, claiming that a lot of politicians have blood on their hands. He believed that inaction on the part of western governments to stop Assad’s annihilation of his own people was a grave mistake. ‘Doing nothing,’ he said, ‘cannot be dressed up as political strategy, it is still ‘doing nothing’.